We’re excited to share the latest evolution of Allegheny’s web site. We know what you’re thinking: didn’t you just redesign the site not too long ago? Indeed we did. 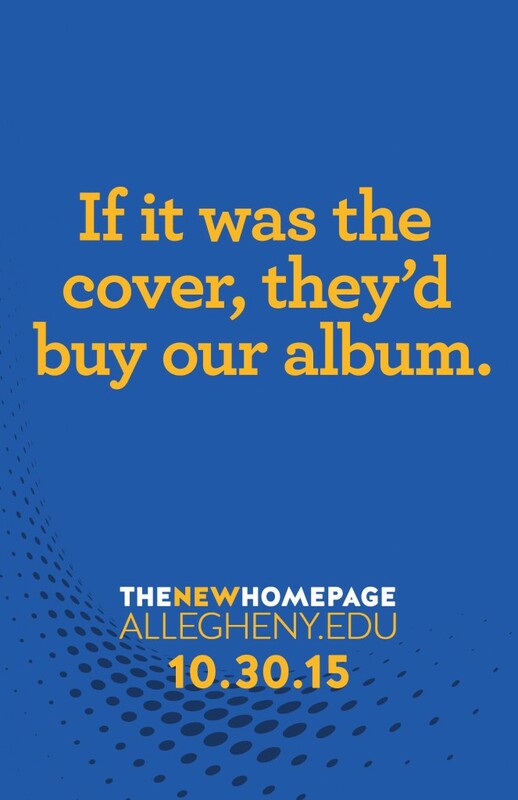 In 2013, we launched a complete overhaul of allegheny.edu. While that design still worked and we could have used it for a few more years, our mantra is to keep pushing forward. We recognized opportunities for improvement — expanded global navigation, deeper social media integration, making it easier for prospective students to apply or request info — and we took action. Although the redesign is mainly confined to the college’s home page for now, we’ll be bringing the rest of our sites into the redesign over the rest of the academic year. This is simply Phase 1 of an ongoing project, with the site continuing to evolve in the months ahead as we respond to opportunities to make it even better. Thank you for sharing your feedback with us, and we hope you’re as excited about the redesign as we are. Based on statistics, communication priorities, and best practices, we crafted the content and the design to make new users feel at home. As we continue to watch the statistics and talk to users, we will continue to optimize their experience. 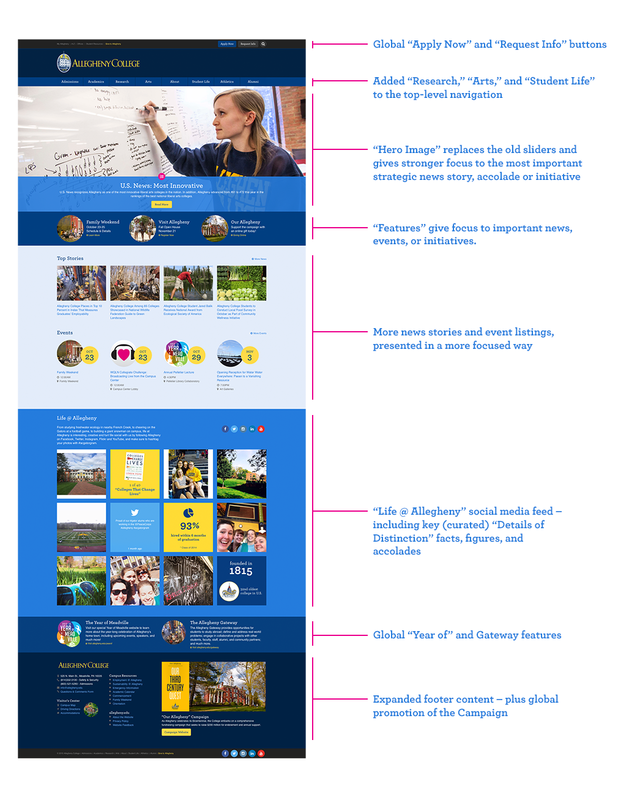 We did an extensive audit of the content on the existing home page, traffic across all of Allegheny’s websites, heat-mapping on the home page (we can see exactly where users click), terms that users search for when using our on-site search feature, and then matched that data to our college-wide communications goals and to the Strategic Plan. It was only after we were satisfied with what the content needed to be that we moved on to visual design. Traffic to websites via mobile devices continues to grow rapidly. Our design process started with mobile-sized screens and moved up from there, utilizing modern web technologies (such as Responsive Web Design) to ensure that the website would scale in order to be usable on any modern web-enabled device. This enabled us to design not just for the specific devices of today, but to design for what the web will be. From your new phone to your new car with a touchscreen, to your HDTV, this new design will scale appropriately across all platforms, providing a full-featured experience across the board. 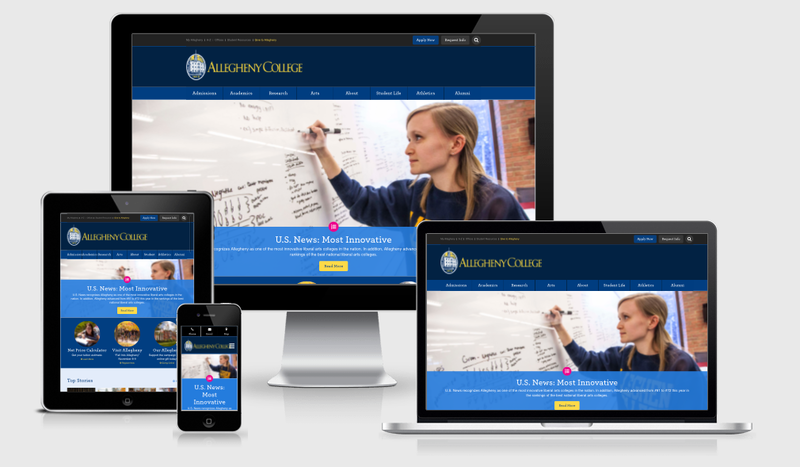 We wanted the new home page to be a window into life at Allegheny for prospective students and their families. We’ve accomplished this through feature more news and events items and by introducing a new social media section named, appropriately enough, “Life @ Allegheny”. This content will be refreshed on a daily basis, keeping the website vibrant and giving visitors a robust and dynamic view of what it feels like to be part of our community. We’re really excited about this. Under each of the top-level navigation items is a brand-new rollover section. This gives us the opportunity to introduce each area, direct users to key pages, feature timely updates and news, feature new accolades in each area, and much more. Like the rest of the site, this area will be refreshed frequently with new content and media. First of all, we’re excited to hear your feedback! Rollout this design to all official Allegheny sites. Academic departments, administrative offices, and everyone in between can benefit from the above enhancements — and more that are on the way. We will roll out the new design to all sites that are in our WordPress content management system over the rest of the 2015/2016 academic year. Continue to enhance supporting sites. Big changes are on the way for the Events website, the News website, and much much more. We’ve got a number of fun projects up our sleeves that we can’t wait to share. These projects are all in the service of Allegheny’s strategic priorities and will continue to make our web, social media and video marketing efforts stronger and more robust. Thanks to everyone who has contributed to this project in ways large and small. We hope you, the Allegheny community, are as excited as we are.